PocketMedia® Solutions has produced yet another new product, an innovative Pop-Up desk calendar – with a cellphone holder and place for pens – for Discovery Insure. Community radio stations that hook listeners with their flagship drive-time programmes have a better chance of ensuring station loyalty. 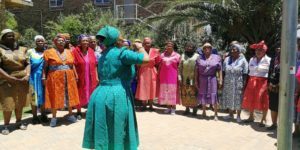 Colourful clothes and fabulous food characterised Thembalami care centre’s Heritage Day celebration on September 23.